I’ve seen a lot of talk about diabetic hamsters lately so I thought I would share our story of dealing with diabetes in our dwarf hamster Toffee. Of course, there are already great resources out there. For example, Diabetes in Hamsters - Vectis Hamstery and Exotics is an awesome resource. This is not medical advice. This is simply my experience attempting to manage diabetes in a dwarf hamster. You should always consult your vet about your own hamster’s illness, and never assume that glucose or ketones in the urine necessarily means diabetes. There are other conditions that can cause that and a vet is definitely the best person to diagnose that. Additionally, I make no claim that the path we took was the best course of action for every hamster, it was right for us with this particular hamster, but we could come to a different conclusion next time we have a hamster showing signs of diabetes. So, this story actually starts in October 2012 when we went to an exotic animal expo and bought two little 4-8 week old dwarf hamsters, Toffee and Speck, from a person breeding dwarf hamsters as feeders for reptiles. We knew that they almost certainly had poor genetics, were probably hybrids, and likely were at risk for diabetes. From that point forward they lived in our home with lovely cages, lots of toys, and a good diet. Their diet was part Harlan Teklad 2018 rodent blocks (good protein, low fiber), part oxbow hamster food (low protein & lots of fiber, but not really well loved by hamsters), and part custom seed/grain/legume mix homemade by us with approximately 18% protein, 6% fat, and 9% fiber. For a year things went fairly well. Speck went blind, but wasn’t really bothered by that, and Toffee was very healthy. Then on October 1, 2013 tragedy struck, and we found our little Speck struggling for his life. 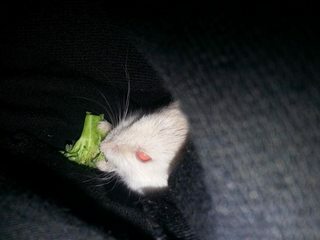 Of course, it was the middle of the night on Sunday, the nearest emergency vet that will even see our hamsters is 2 hours away, and Speck ended up dying in my hands shortly after we found him. After talking to the vet it seemed likely that it was sudden onset kidney failure that killed Speck, and there was probably nothing we could have done. After that loss we started watching Toffee even more closely as we suspected genetics played a role in Specks problems. The first hint that something might have been wrong was on November 13, 2013 when Toffee weighed in at 59 grams (about 2 grams less than normal). Of course, we were able to brush off the 2 gram loss as normal variation. In retrospect Toffee might have been drinking a little more than normal at this point but it was barely noticeable. Then on November 22, 2013 I was holding Toffee and he felt like he had lost some weight so I weighed him and he was down to 52 grams. At that point I realized he had been drinking and peeing more, and I thought we were probably looking at diabetes. We tested his urine with keto-diastix (Amazon.com: Keto-Diastix Reagent Strips - Box of 50: Health & Personal Care) and discovered that he had high glucose and no ketones in his urine. We decided to monitor him for the moment because our vet is approximately 2 hours away, it was a Friday, and the next week was full schedule of classes followed by Thanksgiving (so nothing was open). We monitored him, and tried some fenugreek seeds to see if we could get the glucose in his urine down that way first. 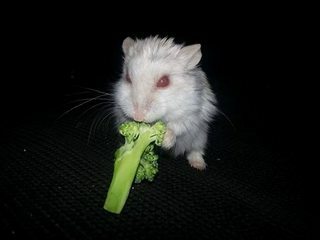 There wasn’t really anything we could change in his diet as it was already good for a hamster with diabetes, and he wasn’t an overweight hamster so we didn’t really think it was that. Toffee stayed pretty stable with his weight going between 55-52 grams, but his water consumption was still quite high, and there was still glucose in his urine. As we weren’t seeing a change we decided to make an appointment with our vet and on December 6, 2013 we braved the massive snow storm that had hit our area and headed out for the vet. Toffee weighed in at 51 grams (so pretty consistent still). The vet did a blood test and found out his blood was quite lipemic (high fat content) which could be for a variety of reasons, diabetes included, but the high fat content screwed up the glucose reading. Because she didn't feel like she could comfortably diagnose diabetes without accurate information she wanted to use a glucometer to test blood from a nail quick. I knew Toffee needed meds if he was going to survive so we went for it. She also tested his urine which of course was full of glucose. 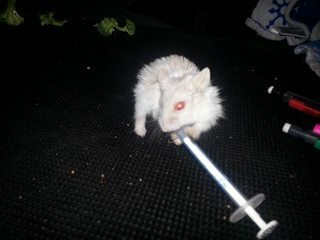 She wasn't really sure what to do because she hadn't had a chance to deal with diabetes in hamsters before. I suggested glipizide and she said she would do some research, talk to her colleagues, and get back to me. We were given the option to leave him there or take him home, and decided to take him home. The next day, Saturday December 7, 2013, I talked to the other vet in the practice (who has more experience but had never dealt with this before either) and she thought insulin was the way to go. I wasn't comfortable with that because daily injections seemed like it would really take a toll on quality of life. I also weighed Toffee that day (less than 24 hours after taking him to the vet) and he weighed 48 grams. I was concerned but I figured the stress of the day before might be contributing and all I could do was keep moving forward with this. The next day, Sunday December 8, 2013, the first vet called me to tell me she had done some research and there wasn't really a whole lot of good research out there about using glipizide or insulin for hamsters. She said that she was willing to let me make the call about what to try so I decided that I wanted to try glipizide first. If it didn't work then we could talk about moving onto insulin, and if I felt the regular injections were hurting his quality of life I could always just stop and we would be no worse off. The next day, December 9, 2013, she called in the glipizide prescription to a compounding pharmacy, and the meds were going to be delivered that Thursday, December 12. From the time we went to the vet on December 6 to the night the glipizide arrived we weighed Toffee water bottle every night (and converted grams to ml of course) and discovered that for each 24 hour period he was drinking approximately 40 ml of water. Additionally, we decided that to keep tighter control on Toffee’s diet, and hopefully blood sugars, we would feed him lab blocks (harlan teklad) only and supplement the low fiber levels with some good daily veggies. On December 12, 2013 the glipizide arrived from the compounding pharmacy. We were going to start off giving Toffee a very low dose of glipizide once a day and titer up from there. I did a urine test before giving him his first dose and it showed that his glucose was very very high and his ketones were at trace levels. We gave him a half dose of the glipizide that night because we weren’t sure how he would react. The next day, December 13, 2013, Toffee weighed 48 grams and at about 6:30pm we tested his urine again before the next dose. 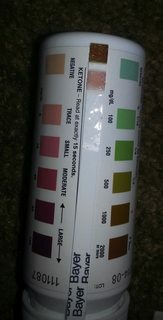 The urine test was pretty much exactly the same, high glucose and somewhere between trace and no ketones. However, when we measured his water consumption we discovered that in the 24 hours after his first half dose Toffee had drank only 29ml. At that time it gave us a lot of hope that the glipizide might work, but looking back at his records it seems pretty clear that, while on the low side, 29 ml was within the normal variation of how much Toffee was drinking. Later that night at about 11:30 we tested his urine again and it was still pretty consistent, although there appeared to have been a slight rise in ketones. On December 14, 2013 Toffee weighed in at 47 grams and drank 32 ml of water. He was still on the very low dose of glipizide once a day and I suspected if we were going to see any results he was going to need a high dose in the long run. I knew we would probably never see no glucose in his urine, but I at least hoped he would start to gain weight and his water consumption would go down to a more reasonable level. Things stayed pretty consistent for a while there. On December 20th we left to go see my family for Christmas, and took Toffee with us. Our records are lacking a bit from that time period, but nothing really changed. We slowly titered the glipizide up to a higher dose twice a day under the direction of our vet, but things didn’t really get better despite the fact that we were giving him at least 20x the dose we had started on. There were rarely any ketones in his urine, his glucose was always high, he drank a ton of water, and lost some more weight. It seemed like the diabetes was progressing and the glipizide just wasn’t doing anything. On December 30th, 2013 I wrote a message to our vet letting her know that the glipizide didn’t really seem to be working and I was willing to at least try insulin injections. I still had the same hesitations about insulin as I wasn’t sure daily injections would be good for Toffee’s quality of life, but Toffee didn’t really mind being handled and scruffed so I figured we could at least give it a try. On January 8, 2014 we took braved another awful snow storm (see a pattern here) to take Toffee to the vet. The vet checked his blood glucose again and we basically determined that the glipizide wasn’t doing much of anything one way or the other. She talked to her colleagues about how they normally do insulin in other animals, and the answer was basically send the pet home with the insulin and let the owners titer up slowly until we reach an effective level. Her big worry at that point was the risk of Toffee getting dehydrated, but since we are capable of giving sub-q fluids at home she felt fine sending him home with us to start the insulin. That night, January 8, 2014, we started once a day insulin injections at 8pm every night. Now, Toffee certainly wasn’t a fan of the injection. He would usually let out a short squeak when he got his shot, however, it was over in about 2 seconds and he would happily go back to cuddling us and eating a treat. At 8pm on January 28, 2014 Toffee hit his lowest weight of 32 grams, and his tests were still showing no ketones and high glucose. On February 1, 2014 the metformin arrived and we started giving it to him in the mornings hoping it would help him during the day when there was less insulin in his system. We hoped that this would allow us to avoid a second injection. Things started to get a little better after we added the metformin. His water consumption was the same, his urine tests were about the same, but he was maintaining his weight better. Unfortunately, on the morning of February 6, 2014 we tested his urine and his ketones were incredibly high. We immediately gave him an injection of insulin and at his next test that afternoon there were no more ketones in his urine but his glucose was still high. At that point we decided we couldn’t risk not giving two injections a day so we started doing morning and evening insulin injections. By this point we had gotten better at giving the shots and they were so quick that really it wasn’t a big deal for Toffee. Toffee started gaining weight immediately. The first day we gave him two insulin injections (2/6) he weighed 36 grams, and by the second day Toffee’s weight was consistently at 41-42 grams. Not only was his weight better he was suddenly drinking 22 ml of water on February 6th. By the next day, February 7th, he was down to 20 ml, and then on February 8th he was down to 17 ml of water. At that point we were giving a lower dose of insulin in the morning and a higher one a night. Despite the great improvements in his weight and water consumption the glucose in his urine was still relatively high, if a little lower than it had been before. On February 10, 2014 I talked to our vet and let her know what was going on. She suggested trying the metformin twice a day before we upped the insulin again. His water consumption dropped to around 15 mls with the addition of the second dose of metformin, and the glucose in his urine dropped a little more although it was still very very high. Throughout all of this we had a lot of concerns about Toffee’s kidney function as kidneys are often damaged with uncontrolled diabetes. We had also had some issues with high levels of protein in his urine, but the only thing we could do was keep treating the diabetes and hope that it mitigated some of the damage. We upped his insulin dose a little more and on February 18th Toffee weighed in at 47 grams, drank only 11 ml of water, and had no ketones or glucose in his urine. He looked great! Of course, we assumed this was a one day fluke, but the next day it was the same, and, again, the next. He was active and happy, and got his weight all the way up to 49 grams (sometimes the scale would even flicker over to 50 grams). Unfortunately, this couldn’t last. On Sunday February 23 Toffee had some clear protein strands in his urine so we planned to take him to the vet the next day fearing his kidneys were finally shutting down. He was acting normal though, drinking, weighing in fine, and being plenty active. Unfortunately, late that night he took a turn for the worse and his little body shut down. We knew it was the end and that his kidneys were likely failing, and since the vet was 2 hours away on a Sunday night (at about 11:30 pm when this started) we knew we wouldn’t make it in time. We held him close, cuddled him, kept him warm and comfortable, and let him go peacefully. He was about 1 year 6-8 months old, very loved, and the best hamster I could have ever hoped for. In the end Toffee had almost a month of feeling and looking significantly better, and I strongly believe we would have lost him much sooner with no treatment. If I had it to do all over again I think I would still want to try the oral glipizide first to see if there were fast results like some people report, and then maybe have a try with the metformin ifthe glipizide didn’t work since the metformin seems to be more risky. That said, I think if I had this to do over again I would have moved on to insulin twice a day much more quickly assuming I was dealing with a hamster with a personality similar to Toffee’s. I probably would not go that far if the scruffing and injections were distressing to the hamster (as I have had hamsters that even handling is stressful for them), but I would make that determination based on the individual hamster. This is not medical advice. This is simply my experience attempting to manage diabetes in a dwarf hamster. You should always consult your vet about your own hamster’s illness, and never assume that glucose or ketones in the urine necessarily means diabetes. There are other conditions that can cause that and a vet is definitely the best person to diagnose that. Additionally, I make no claim that the path we took was the best course of action for every hamster, it was right for us with this particular hamster, but we could come to a different conclusion next time we have a hamster showing signs of diabetes. Meier H, Yerganian G. Spontaneous hereditary diabetes mellitus in the Chinese hamster (Cricetulus griseus). III. Maintenance of a diabetic hamster colony with the aid of hypoglycemic therapy. Diabetes. 1961 Jan-Feb;10:19-21. Toffee sure has been through a while lot! I'm glad you shared your experience with us and I might get some keto-diastix to check on my three dwarfs, they are all rescies so therefore hybrids and their diet is very monitored, but it's better to be safe than sorry. This is a great reasource Xealy - thank you for sharing your experience. As a ham-mum to both a hybrid and a chinese, I'm always on the lookout for diabetes experiences. It's also great to have a vet who is willing to try something a little outside their comfort zone. Toffee had the best chance a loving owner and modern medicine could have given him. I'm glad you got it under control in the end. My little hybrid Chub - Born Nov 2012, came to me June 2013. Chinese Eric - born ?, came home with me December 2013. Poor Toffee... It was really wonderful of you to take the time to write this- thank you so much sharing it. I brought some keto-diastix about a month ago so I could test Pippa and have it on hand, just in case. Wow that was really wonderful of u to save their lives . I'm happy to hear that people like hearing about this experience and maybe, just maybe, it will benefit someone. I actually also kept pretty detailed records for my vet so that if she comes across this again she will have a better chance at treating it, but I figured I would write it up in more of a story format (with precise dosage information omitted) for everyone else. That said, if someone is dealing with this and wants to talk about what dosages of things we ended up trying please feel free to PM me. I'm willing to discuss it, but obviously every hamster will be different and really needs a vet to guide the actual dosing of medications so I don't want to put it out there generally. I enjoyed reading your experience with Toffee. He was beautiful. Such a little fighter. That's a beautiful story. Toffee was a beautiful hamster - R.I.P. to your little ones!